The United States Mint reduced prices today on 17 gold and 1 platinum coin products and it is considering cutting prices on a range of numismatic silver coins and silver sets. 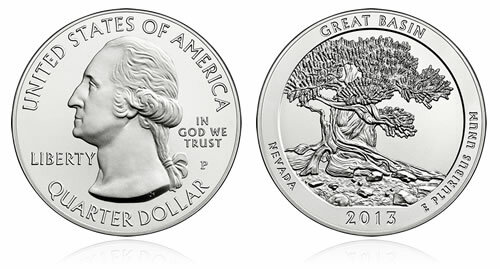 In the wake of sharply lower silver prices, the U.S. Mint has postponed the release of its next silver coin product, the 2013-P Great Basin National Park Five Ounce Silver Uncirculated Coin. It is considering lowering prices on other silver coin products. A decision is yet to be announced, but in the meantime the U.S. Mint has postponed its release of the 2013-P Great Basin National Park Five Ounce Silver Uncirculated Coin. The 99.9% pure silver coin was scheduled to launch Thursday at a price of $179.95. "Due to the recent decrease in the price of silver, the United States Mint is considering lowering prices on several silver coin products," a statement from the Mint noted. "As a result, we have postponed the launch of the 2013 America the Beautiful Five Ounce Silver Uncirculated Coin for Great Basin National Park that was scheduled to go on sale June 27. The new prices will go into effect after being published in the Federal Register and after a new on-sale date has been determined." Precious metals have plunged in the last week with silver and gold near three-year lows. In pricing its gold and platinum products produced for coin collectors, the U.S. Mint watches and averages London fixings for gold and platinum over a several-day period and compares the results to a coin pricing grid. Based on sharp drops from last Thursday to today, the Mint cut its gold coin prices by $100 per ounce of gold content and dropped its price for the proof Platinum American Eagle coin by $50. It does not have the same system in place for its silver coins and related products. In the past when silver has moved sharply lower or higher by several dollars, the U.S. Mint has tended to suspend certain silver product sales until the precious metal has stabilized and until, if necessary, the Mint has published new pricing on the Federal Register. As of this writing, the Mint continues to sell its silver coin products at the same prices through its website (www.usmint.gov). The London silver Fix today was at $18.67 an ounce, marking the lowest price for silver since August 2010. For the week, month and year so far, silver prices are respectively down 6%; 17.3% and 37.7%. I received my two – coin sets from West Point Mint today. They look great. Yeah after I bit of googling I found it. How long do you think it will take them to determine the price changes, if any? How long has the process taken in the past? Isn’t it time for silver to be re-priced weekly by the Mint, just as it does gold? Whatever prevents that from happening should be changed. Why would you buy these 5 oz coins from the mint? They are $60 less at a dealer (Provident metals). The mint is not making much sense here. @Sean, the difference being that dealers sell the bullion version of 5Oz while the mint sells the numismatic version of the same (hence the higher price). The difference in quality can be substantial, especially given all the complaints with scratches on most recent bullion version of Perry Victory puck. I got my mint version of the same yesterday- flawless! I would like to see silver products price revised weekly like other metals. I understand the difference between numismatic and bullion versions, but the argument weakens as the difference in price keeps increasing. There should be a fair way of revising prices. The Great Basin National Park, Nevada America the Beautiful coin contains 5 troy ounces of .999 fine silver and arrives in brilliant uncirculated condition. That is the spec sheet from provident. You are being sold a bill of goods. Have bought silver eagles from authorized resellers. A good part of the time they are spotted or otherwise impaired. Am certain that they are cherry picking the best to grade and sell at a premium, selling the rejects as regular bullion. It hardly seems fair as one pays a premium for the eagle over bullion bars. Have tried the “mint sealed” approach, coins are much better quality. Not all of the resellers ship unsearched US bullion coins. Mint sold coins are much better quality but even then have gotten some zingers. You really do have to inspect each coin when you get them. Have sent more than a few back. The mint takes them back without question and even refunds postage. You have to give them the credit for customer service. The Mint won’t lower their prices in face of lowering costs of operation and wonders why they aren’t selling more coins during this period of time? People shop where they get the best deals and right now it isn’t from the US Mint.